The two cases below assume that the dynamic range is limited by output voltage: that is, the circuit will clip its output and that determines the high-end of the dynamic range. However, in the case where you can’t meet this requirement, you can get rid of MN2 (albeit at the cost of common-mode rejection). We’ve seen a case where the differential circuit shows more dynamic range than the single-ended counterpart. 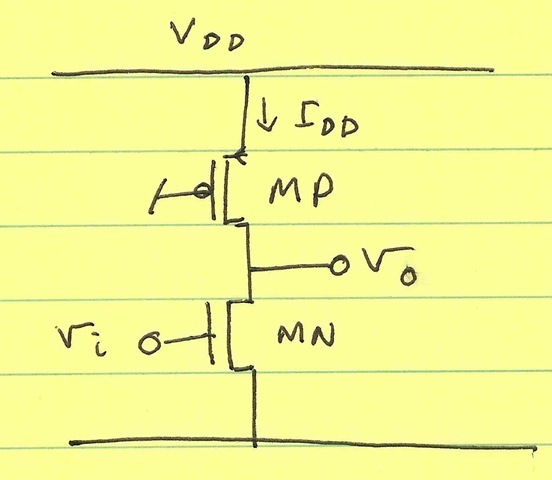 My guess is that most people who say that differential means more current don’t realize that you don’t have to have the same current in each branch of the differential circuit (you can split the current in half). One limitation of the above analysis is that I assume that the input voltage is available in a differential form, and that the output is consumable in its differential form. Obviously, if this isn’t the case, the above analysis may or may not work. The case becomes more specific and the generalization fails. That said, I’ve seen plenty of line-ups where a transformer/balun is placed off-chip to convert the chip’s inputs/outputs to differential. Requiring differential I/O at the chip level doesn’t mean requiring differential I/O at the board level. where α is a factor that indicates what fraction of quiescent current can be used as signal current. The advantage is even more apparent: you’re getting 4× the dynamic range. Common-mode feedback: you’re generally going to need a common-mode feedback (and common-mode sensing). 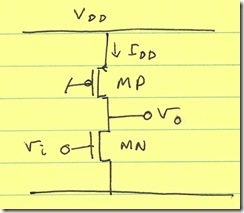 However, even the single-ended topology (shown above) requires some bias adjustment to set its output bias voltage. 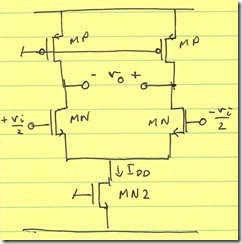 This is more of a property of CMOS design (high-impedance loads) than a trade-off of single-ended/differential circuits. Lower swing: once again, this is a property of the differential pair. But, a lot of the differential benefit (common-mode rejection ratio) comes from using the differential pair. If you’re using minimum-size devices, you end up spending twice the current with the differential circuit than with the single-ended version. However, when (in analog design), have you used minimum-sized devices? The benefits of differential circuits occur when you get to analyze the noise and signal swing differentially. However, if the circuit you’re driving doesn’t respond to a differential input, the benefits aren’t as great. 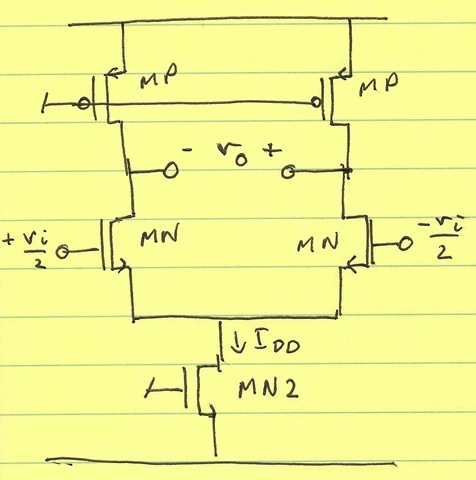 It seems to me that most of the people that globally avoid differential circuits subscribe to the thought that since there are two current branches, there must be double the current. However, like I said above, this is only true if your branches are using minimum-sized devices. Otherwise, you can always split the device in half and distribute the same current across a differential pair. This entry was posted in Analog Professional and tagged differential, dynamic range, Noise, power, single ended, SNR. Bookmark the permalink. Post a comment or leave a trackback: Trackback URL. Good discussion. In my experience, differential circuits nearly always have more significant benefits than single ended circuits. The big one in ICs using single ended circuits is the risk of unknown spurious signals coupling into a critical circuit through the substrate, package etc, and potentially destroying performance. This makes common mode rejection is a huge plus. In my mind, the primary drawback to differential circuits is layout complexity. If the required SNR for a circuit is low, and I want to minimize complexity, that is when single ended circuits have a niche. I completely agree with Mark’s statement. CMRR is the single most important criteria that makes the differential circuits stand out. If a circuit can correctly operate at lower SNR, single ended circuits would be fine. Differential circuits also impose upon layout to be symmetrical especially the difference sensing amplifiers and noise coupling or noise shielding structures.